If you are poor (which I define as “living from paycheck to paycheck”). the definition of rich is “anyone with more money than me”. And that’s where all this “tax-the-rich” thinking all falls down – the rich can afford to move away from taxes. And once they move away, they – and their money, business and investments – will not return. And if you believe that it is the Government’s job is to hold them down and extract the contents of their pockets to “distribute fairly”, then you are nothing more than a thug; well-meaning, perhaps, but a thug nonetheless. I tried to order some flowers online a few days ago. 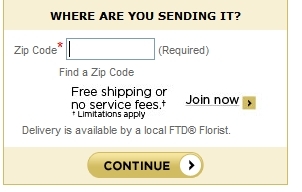 We tried several different sites, from the big boys (proflowers.com, FTD.com) to a couple of smaller players. It was an interesting experience. Many of the websites were quite badly designed, some had a habit of forgetting all the details that you had just typed in if you went back to change anything. But those were relatively minor gripes. What really annoyed me, however, was the way that all of them sneakily hid the delivery and handling fees until late in the process. One successfully hid a $15 delivery fee until the very last screen before placing the order, presumably in the hope that the customer would not be paying attention and would blindly click “submit order”. NEXT! Perhaps the scariest example was FTD. They used this graphic on their page, which looks like they are offering “free shipping or no service fees”. On further investigation they wanted you to take out an “FTD Gold” Membership at $30 a year. The fact that this is one of those “auto-renew subscription” deals is a red flag for me. Nothing illegal here, but very, very sneaky. NEXT! Proflowers added TWO delivery fees, a “care and handling” fee and tax, turning a $30 order into $52. NEXT! Don’t bother creating an account – you may not be completing the order. Once you know you can trust them, go ahead and create one if you want. Never assume anything: As we have seen from FTD, they will use phrasing to suggest that something is free when it isn’t. Watch for the upsell: Sometimes they have a choice of three sizes, and “accidentally” select a larger size than the one you selected. Triple-check before submitting the order – just in case a charge (or two… or three!) somehow sneaked into the order. Don’t reward bad behavior: You my be tempted to just pay the charges and get it over. Don’t do it. Once they know the order and the delivery address, they have enough information to tell you the delivery charge. If they try to surprise you with a “Gotcha!”, give them a “Gotcha!” of your own – take your business elsewhere. And finally… Check your e-mail: Sometimes one of these outfits will notice that you left without ordering and will offer to waive the shipping fee. This is what happened to us, and they got the business. The winner was fromyouflowers. The flowers arrived on time and they were lovely. they have my recommendation and I will be using their services again. For about a month I have been following rumors that Verizon was going to introduce Family Shared Data Plans and use them as an excuse to get rid of grandfathered unlimited data customers like me. Today the official news hit the interwebz. The rumors were true, and the changes are worse than we could have imagined. The good: They are introducing unlimited-talk unlimited text plans. The bad: Talk may be cheap, but data is horribly expensive – starting at $50 for 1GB, going up to $100 for 10GB, with nothing beyond that. The Ugly: Upgrading to a subsidized (i.e. cheap) phone will rip you out of your grandfathered unlimited data plan. On their website they say “you have a choice”… but the choice that they give you is “pay full price for your phone or lose your unlimited plan“. Some choice. When I upgraded to a Smartphone last year, I was offered an “Unlimited” Data plan. Six weeks later, they discontinued the unlimited plan. I was informed that I was “grandfathered in”, meaning that as long as I did not change my plan, I would keep unlimited data, even if I upgraded my phone. Most months I have used 1-2GB of data, though one month, when I was streaming with Netflix, I believe that I passed 5GB, but that was an outlier. So I am hardly a “data hog” – Verizon’s main reason for killing unlimited data. In addition to my phone, our plan has two non-smart-phones (Verizon calls them “Basic Phones”, but to almost everyone else they are “Dumbphones”), partly because $30 a month is a lot to pay for data that you don’t really need, and partly because Her Ladyship has a tendency to drop things. While I initially balked at the price, the value of the data has been worth the dollar-a-day cost. Our total monthly bill comes to just over $120. The new plan will cost about $150 (180-25%+taxes, fees and insurance), assuming I use only 2GB per month. If I use more then the cost goes up dramatically. Ever since Verizon discontinued the Unlimited Plan, they have been trying to get people off it. The latest announcement – apparently an off-the-cuff remark by the CFO – has revealed their latest scheme: if you upgrade to a discounted phone, you lose Unlimited Data. This is particularly irksome to me; the one weakness of the Droid X2 is that it is a 3G phone – one of the last ones released. I had hoped to upgrade to a 4G phone and keep my unlimited data, now it feels like they are snatching out the rug from under me. I understand that Unlimited Data Plans are a monkey on a Cellco’s back – but if they can’t handle the traffic, they should not offer the plans. I also understand that some users who, in their zeal to “get their moneys-worth”, use exorbitant amounts of data, need to be throttled. But there are other ways to crack that nut; just identify the persistent data hogs and deal with them individually. The aggressiveness of this move smacks of Verizon’s having made promises with every intention of reneging on them later. This sort of brain-dead corporate maneuver is nothing new: late last summer, Netflix decided to raise their prices by 60%. At the time, I commented about what a bad idea that was, but Netflix management thought that the impact would be minimal. Events proved me right; they had a disastrous Q3 and Q4, with a crash in the share price and a net loss of over 800,000 customers. And that didn’t include many more people like me, who stayed but cut back their service. Having seen the comments about Verizon’s proposed change, I am of the opinion that this move is every bit as bone-headed as what Netflix did last summer. While Shared Data Plans are a good thing, in principle, customers should have the choice to keep the deal that they signed up for if they prefer. Trying to force your customers to do business on your terms is rarely a good long-term strategy. Upgrade my phone to a 4G one before the change comes into effect. This would be a lot of hassle, but is doable. Wait until after the change comes into effect, then purchase a new or used 4G phone. Leave Verizon when my contract is up. …instead of trying to force the decision upon them. Just got back from a long weekend in the Amish country of Ohio. All went well; the hotel was nice, the food was great, and all had a wonderful time. On the way back, we stopped in to Schmidt’s Sausage Haus und Restaurant in Columbus. The food was excellent and the service was beyond compare (thanks for looking after us, Mike!). Neither of us are big eaters, so we normally split a single entree – that way we can leave room for dessert. During the meal, Her Ladyship informed me that two ladies at a nearby table were snickering at our splitting our Wienerschnitzel (stop sniggering, you in the back). I suppose that some folks see people splitting a meal and assume that they are being cheap, but we let it pass, and before long they went on their merry way and life went on. On the way home, we were talking about it, and it has become the most though-provoking memory of our trip. When a couple of 300lb tub-o-lards are laughing at your eating habits, you’re probably doing it right.